Range: There are several subspecies of rose tarantulas, yet Chilean rose tarantulas are found exclusively in Chile, South America. Habitat: Their habitats range from Mediterranean climate to a coastal rain forest. They live in burrows in the ground, which they have dug or found abandoned by rodents. The burrows are lined with silk produced by the spider. Diet: They eat mainly insects and other small arthropods. We feed ours crickets. Lifespan: Females can live up to 25 years. Chilean rose tarantulas get their name from the pink color of their hairs. Chilean rose-haired tarantulas are the most common tarantula seen as pets in the United States. They are slower and gentler than other tarantulas, which makes them easier to handle. Tarantulas have a defensive behavior where they flick hairs off their abdomen with the back legs, usually flinging them into the eyes of predators. They cause irritation and are itchy, giving the tarantula time to flee. These hairs are called urticating hairs. 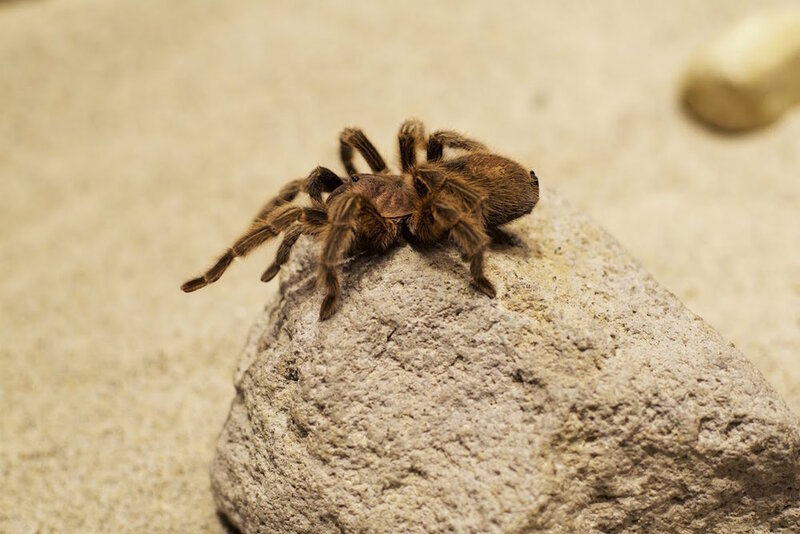 There are no tarantulas that can kill a person; their bite is similar to a bee sting. Contrary to a popular myth, females rarely kill the male after mating; most male tarantulas live for another one to two years after mating.